After weeks of speculation, the Banco Central de Venezuela (BCV) finally confirmed today that it was unveiling a new set of bills and coins amid the worst inflationary crisis in the country’s history. The BCV announced that there will be six new paper bills and three new coins added to the near-worthless current currency lineup. At the current black market rate (Bs. 4,400/USD), the highest denomination bill in circulation – Bs. 100 – is worth two cents. While the BCV does not publish economic figures and the Venezuelan government does not speak of inflation in anything but the vaguest terms, the introduction of the new bills is tacit admission that runaway inflation is a problem in Venezuela. After December 15, the highest bill in circulation will have a value 200 times higher than the highest bill in circulation today. The [introduction of the new bills and coins] will make payments more efficient; it will facilitate commercial transactions and minimize production costs, and the replenishment and transport of money, which will translate into benefits for banks, commerce and the general population. The National Assembly will move to appoint two new rectors to the Consejo Nacional Electoral (CNE) on Tuesday, hoping to bring change to the pro-PSUV government body which is in charge of overseeing elections in Venezuela, The move was confirmed by National Assembly opposition deputy Juan Guaido yesterday. While it is unlikely that the PSUV-controlled Supreme Court will allow the move, the opposition is hoping to replace rectors Tania D’Amelio and Socorro Hernandez – whose terms end on Tuesday – with two pro-opposition rectors. 14 political prisoners held in the headquarters of Venezuela’s political police – the SEBIN – started a hunger strike today after the PSUV failed to release them, contrary to an agreement reached with the opposition in November. The prisoners are being held in El Helicoide, an imposing building in Caracas that houses the national offices of the SEBIN. Today, December 4 2016, at 5:00 PM Venezuela time; as a consequence of the regime’s inability to comply with the points to which it agreed at the dialogue table, such as the release of political prisoners, the opening of a humanitarian corridor and holding elections as it is our constitutional right to elect; based on our innocence, our democratic principles and our commitment to free Venezuela [and\ taking into account the deterioration of health that we who are imprisoned here are suffering; affirming our faith in the dignity of every human being and of our families, we have decided to begin an INDEFINITE HUNGER STRIKE. Our hunger strike has come about as an answer to calls for a CHRISTMAS WITHOUT POLITICAL PRISONERS. We also ask for the Holy See’s intervention through the person of the Apostolic nuncio. We urgently call on all our colleagues from different political organizations, as well as from the student movement and the Venezuelan people to join us in this struggle. We stress that even though we are prisoners, our rights as citizens are untouched, and making use of our Constitution as our only weapon we assure all of you that we will remain in this hunger strike until the end. Our creed is and will continue to be the creation of a genuinely democratic nation. This is why we were imprisoned, and we are willing to give up our lives for this. To our fellow political prisoners who are being held in other prisons, we ask you to join us so that together we may win freedom for Venezuela. 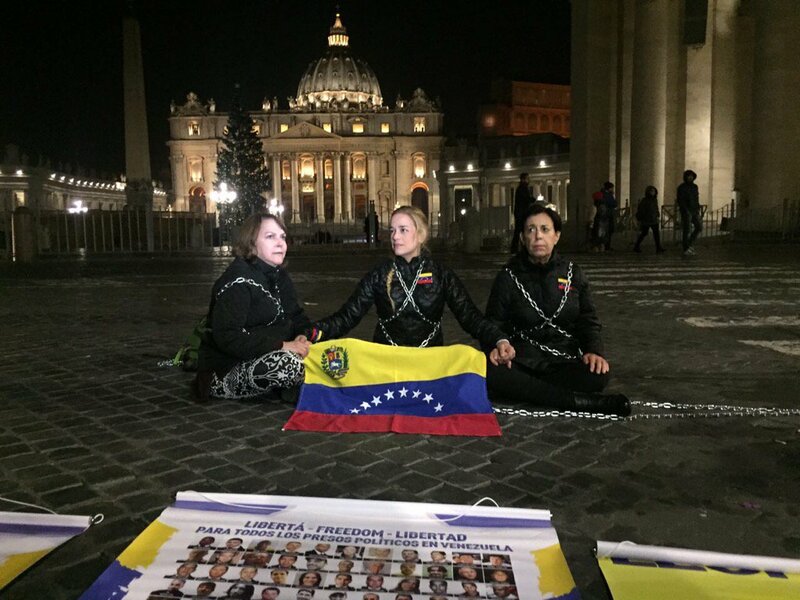 Lilian Tintori (Leopoldo Lopez’s wife), Antonieta Lopez (his mother) and Mitzy Capriles de Ledezma (Antonio Ledezma’s wife) have chained themselves – apparently to one another – at St. Peter’s Square in the Vatican in order to bring attention to the plight of political prisoners in Venezuela. It is not clear whether the three women have chained themselves to a permanent fixture in order to hamper their removal from the scene, or how long they plan to stay there. The act comes as the PSUV and the opposition are expected to meet again on Tuesday to discuss a peaceful resolution to the crisis in the country, particularly the fate of the 109 political prisoners currently behind bars in Venezuela. The Vatican is part of a dialogue that is taking place in Venezuela, but the dialogue has not yielded results. [I want to] remind the Vatican and the world that there are more than 100 political prisoners in Venezuela. They [the political prisoners] must be released right now. The December 6 talks must yield results, and the first result must be the release of all political prisoners. I represent the pain and suffering of all Venezuelan mothers who see their sons humiliated, assaulted, tortured; yet they are innocent. They are imprisoned simply for exercising their right to dissent. Venezuela is a spectacular country. Sadly, as Venezuelans we have been forced to leave the country to yell to the world the horror that we are living. But God willing, there will be a change in government and the [new] government will take Venezuela once again to that place of honour it had always had in the world.